The Olympics are upon is. I don’t watch much of the opening ceremony except for the march of nations and the lighting of the flame. Last night was a great show, and when Paul choked up on the opening of “Hey Jude”, well, I kind of choked up too. An athlete I will be rooting for is Georganne Moline who is running the 400 meter hurdles in London. I do not know Georganne personally, but she ran track for Thunderbird High School when I was the head track coach at Apollo High School. Georganne was the best at what she did. There goes Georganne, and then here comes Apollo. I swear she ran track for seven years at Thunderbird. I would look at T-Bird’s lineup, see her name and ask, “didn’t she graduate last year?’ Georganne went to the University of Arizona on a track scholarship. This year she qualified for the Olympics. How exciting for her. A tv station in Tucson did a little bio on her and I watched it yesterday. They did a little interview with her, filmed her training and weightlifting. Georganne talked about how she hated track in high school when she first went out and almost quit. She talked about how when she came to the U of A she couldn’t even lift the empty bar. Now she was doing power cleans better than most guys do them. I got to thinking about how much of a change there is for an athlete after he or she gets out of high school. I don’t think anyone, not even Georganne, would have predicted her trip to the Olympics 3 years out of high school. But sometime in the course of her track career, the switch turned on in her head and she drove herself to be the best she could be. London Calling. The other athlete I thought about is Prince Amukamara. Prince is yin to Cindy’s yang. Prince is the best athlete I have ever coached in my 31 years of coaching. Prince is also one of the nicest, humblest people I have ever met. I could take up pages and pages giving examples of his quality of character, but I will just give you one example; with over 1,500 Facebook friends wishing him a happy birthday, he responded to each one with a personal post. I don’t know very many other people who do that. At Apollo, Prince garnered 3 state championships in basketball and 2 individual state championships in the 100 and 200 meter sprints in track. He was the state of Arizona football player of the year his senior year. 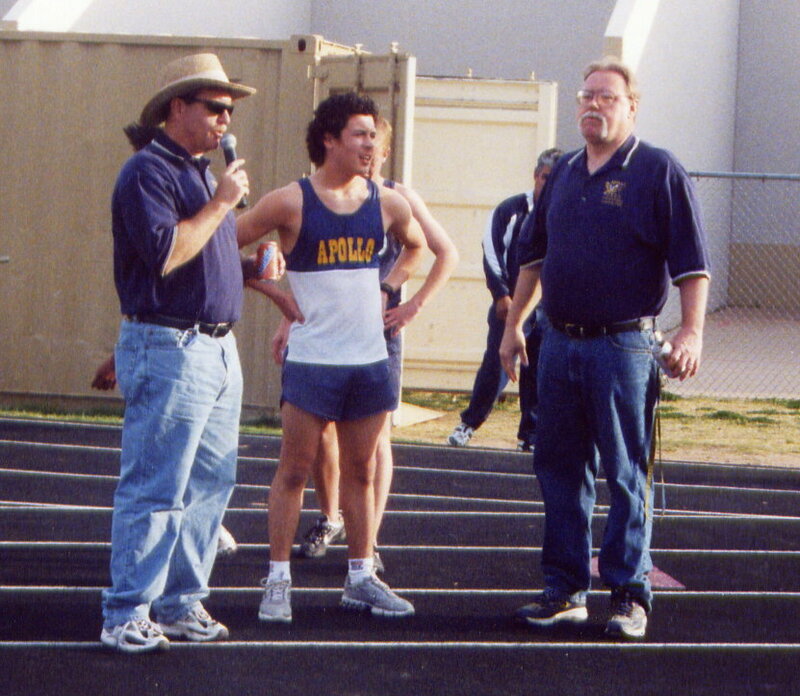 I was fortunate enough to coach Prince in track and football. His senior year in track was a bit iffy to start with. He dropped a shower door on his foot and was hobbled most of the year, plus he had a little issue with his knee. My able assistant, Dave Devlin, adjusted his training and rested Prince enough so that he dominated the 100 and 200 at state. In football, I was Prince’s position coach on offense, the running back’s coach. I told Prince “run where they ain’t. Don’t fumble.” Then I spent the rest of the time coaching the fullback on how to block. But Prince was not without his detractors his junior and senior years. “Prince doesn’t lift weights.” “Prince can’t tackle.” “Prince doesn’t like to hit.” were some of the real or imagined faults that some people mentioned during Prince’s playing days at Apollo. Some even said Prince would never make it in college. Part of Prince’s image problem was that he was a merry prankster. Although deep down he took football very seriously, outwardly he was happy-go-lucky and appeared to not take things seriously. This rubs some people the wrong way. I do remember talking to Prince during his last track season and telling him that things were going to be different in college. Coaches won’t have a sense of humor, and everyone there is as good as you are. I doubt that this even made an impact on Prince, or even if he heard it, but I like to think it was the advice that made his career. And just like Georganne and Cindy, things fell into place for Prince to become the best he could be. Prince not only excelled in football at the Nebraska, but was the number 1 draft choice of the New York Giants as a defensive back. He missed the first part of the season with a broken foot, but on his first play in the NFL he recorded an interception. He was on the field, playing defense for New York when New England was making his final drive. Prince, the player some felt would never make it in college football, now has a Superbowl Ring. There is a shot in Sport’s Illustrated of the end of that Super Bowl, a long shot taken from the end zone. It shows everyone running around in total excitement, and in the end zone is Prince, a devout man of faith, on his knee, thanking God for the victory. Prince, I am proud of you and glad I got the chance to coach you. I think this is one of the reasons I like the Olympics. It is the best of the best of the best in sports. When I watch the parade of nations it is exciting to see the joy in the eyes of all the competitors from all the countries. Yes, I will chant USA with everyone else when the time comes. I will get a little teary eyed when they play the Star Spangled banner during the medal ceremonies. But I believe you have to honor all the athletes. All of them represent the best that each country has to offer. And this is what I like about the closing ceremonies. Seeing all the athletes together, all the pins and souvenirs exchanged, the smiles, the brotherhood and sisterhood and human-hood on display. I’d say the following article sums up the spirit of the Olympics. The Olympics are about this lady, Nur Suryani Mohammed Taibi and her competition in these games. I am also leaving you with two more links. The first is for the news special on Georganne Moline. The second is for the “Fanfare for the Common Man”, a song that will make brushing your teeth feel like an Olympic event. Happy Olympic watching. COACHING TRACK AND ROCKIN’ THE FOO MANCHU STASH LIKE THE DAD FROM ORANGE COUNTY CHOPPERS.